I met a gentleman the other day that was 96 years young! He was surprisingly agile and swift on his feet. He had few wrinkles and looked really good for his age! I was really impressed and thought he wasn’t a day past 70. That got me to thinking about ‘maintenance’. If I exercise, take care of myself, eat right and stress less…. Will that help me to age just as gracefully? There are Eagle lifts out there that have been doing their job for decades and still run like the day they were installed. They have aged well, with the right maintenance and care. Do you know how to maintain your lift so it will run like new for many years? Luckily, it’s easier to know how to help your lift age well…. my wrinkles, not so much! LIFTS MUST BE MAINTAINED AND INSPECTED REGULARLY TO ENSURE SAFETY. Perhaps the most important car lift maintenance is to adjust the cables. Over time, the cables stretch and if not adjusted, a cable can jump a pulley or cause the lift to rise unevenly. Each cable should have about .5” of deflection (should not move more than .5”). This is true for a two-post or four-post lift. Adjustments are very simple to do and the steps are specific in the manual provided with your lift. Please look that over for instructions on how to adjust your cables. Next is lubrication on your lift. Chain rollers, cable pulleys, safety latches and carriage tracks inside the towers. We recommend white lithium grease. You should do this weekly. A simple walk around your car lift for a safety check is easy, yet rarely done. Make sure there is nothing in the tracks or carriage (shop rags, tools, cardboard, etc.) that may cause the machine to bind up. Run the lift up and down without a load and ensure the safety features are in working order. In fact, there is an entire American National Standard outlining the safety requirements for proper vehicle lift operation, inspection and car lift maintenance. The ANSI/ALI ALOIM covers lift operator qualifications, training and responsibilities; car lift maintenance procedures, documentation and frequency; and periodic qualified lift inspection. In addition to regular in-house inspections, the standard requires that all vehicle lifts be inspected at least annually by a “qualified lift inspector.” A lift inspection is a thorough evaluation of the operating mechanism(s), safety system(s), maintenance, structural integrity and field modifications of a particular lift in order to identify any risks which may affect the ability of that lift to operate in a safe and reliable manner. 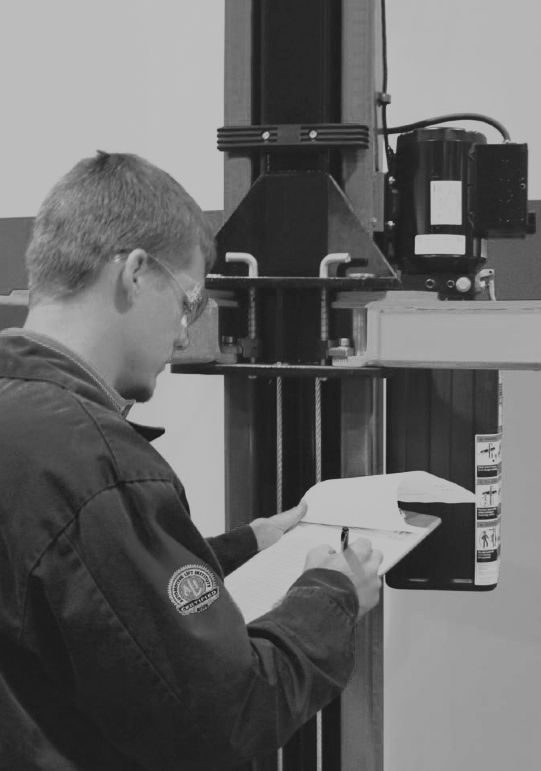 Read more on Annual Lift Inspections, Click Here. – Lift cables normally require replacement every four to five years. – Lift cables should be replaced if you see three or more broken wires in one strand. areas, cutting, spreading, a cable core protruding, or any other abnormality. wipe down with a clean rag. could result in property damage and/or personal injury. – Give the lift a quick once-over before using it. Check for any obvious leaks or defects. Inspect cables, hoses and chains for any sign of wear. the arms and carriages are working. – Lubricate all chain rollers and cable pulleys. Grease the carriage tracks inside the towers. – Check all nuts and bolts; tighten where necessary. – Check and lubricate all safety mechanisms; ensure they are in proper working order. Replace any worn or defective parts. – Check and tighten anchor bolts as necessary. – Inspect all moving parts; replace any worn or defective parts. I have a eagle 2 post lift that lifs uneven but nobody can help me fix it. Who can I pay to fix it? Following proper maintenance for your car can make it last longer. Checking the tires and oil before going on a trip will make you travel smoothly and safely. All parts of your car must be checked regularly. Next Next post: Beware the generic car lift! Do you know who you’re buying from?